Pints up to the fantastic & very good sports who joined me for a bit of performance art at the TRA Marketplace show last week in Houston, Texas. Sasha & Ginger at TRA. It’d call it ‘delish-elada! 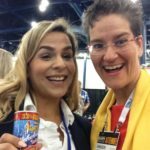 I was lined up to give two What’s Hot In Craft Beverage sessions in their recently expanded Craft Beverage Pavilion this year (gave 2 last year too). In plotting the sessions, I thought: “Let’s invite some of the terrific exhibiting businesses.” So I reached out to 4, 3 reached right back, almost immediately, and I invited them to join me on stage. Props to the following guests who sat with me (check out the TRA’s Facebook page [TX Rest Assoc] for the recorded sessions). Here’s a bit about them. Follow the links to learn more. Sasha & Juan Sotelo, Triple S Michelada – yum yum yum! Check out their story and enjoy their super flavorful beverage as a stand alone drink as well as a mix choice. 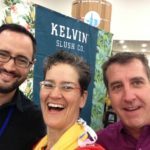 Zack Silverman, Kelvin Slush Company co-founder. When’s the last time you had a slushie??? How about one with delicious enhancements? They had 4 refreshing choices – I sampled them all. Paul Imbesi, NAB representing Barritt’s Ginger Beer. Of course I noticed this right off the bat. And Paul was a fun and gracious guest, sharing the unique story of how he helps bring Barritt’s to the USA. Zack, GJ & Dave/TRA enjoying a great vibe at TRA. I’m always grateful for people who are willing to interact – sometimes even when they’re unsure of what’s going to unfold. As a presenter, I have to be ready for anything, and prepare for everything. Having guests bolster a simple talk skyrockets the value for the audiences and begins very fun and fruitful relationships. The gist: Invite others to work together. It’ll add so much enjoyment and purpose to your work. All my guests we’re easy to work with and guide and I appreciate the hard work they all do, day in and day out. Props to their colleagues too, for tending the booths while we were in session (Helena, Nick & Rodger – this means you!!). One post-show thought for me to all of this: I’d gladly invite them again, and I’d welcome working with all of them. They are sharp, interested in making a true difference in the beverage and restaurants communities and in their own lives. Doing what you love drives a lot of success.